Kristen Stewart is soft and feminine with this layered razor cut. Her auburn tones and highlights complement her pale complexion beautifully. The hair is heavily layered throughout the lengths, using a stylist’s razor, creating wispy ends. The hair is parted to the side and sprayed with a heat protectant spray and very roughly blow dried. 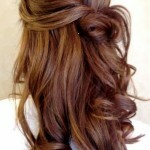 As this hairstyle has plenty of layers, the hair will give a natural flick to the ends with very little prompting. If additional curl is required, this is easily achieved by using a curling iron, however, the messy layers is the look that she has gone for. Do you love this red hair color, and this color is hot in Asian, especially in Japan and China!